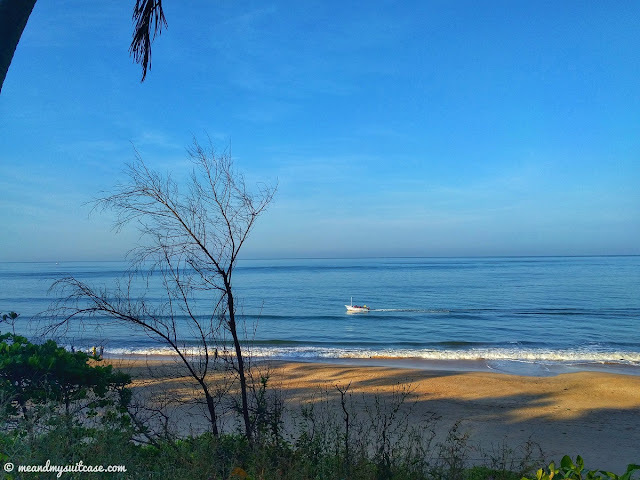 If you live in Goa or Maharashtra, you are well aware of the name Ganpatipule, a place known for the Ganpati temple right on the beach and for many spectacular beaches, housed in the vicinity. It's a serene, less populated, peaceful small town located in the Ratnagiri district on the Konkan coast and is more like the countryside of the state, Maharashtra. Its humble aura, people and food makes you want to never leave. Not known to many from other parts of India, Ganpatipule can thus make for a little offbeat destination too. 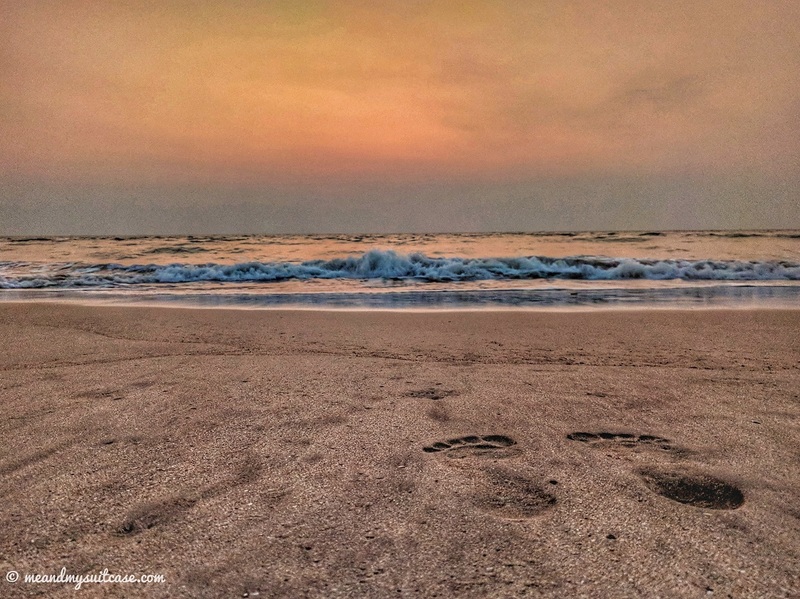 I had been planning to visit this serenity since the day I came to Mumbai, made many plans with family and friends but they never once worked in my favour until the first weekend of November 2018 when I and my college buddy planned to take off from our respective cities and meet in Ratnagiri for a little holiday away from the crowd and hectic work life. Nonetheless, we were meeting after 9 long years. Ratnagiri is midway Goa and Mumbai and I visited the place from Mumbai and my friend Sonia from Thivim (Goa). I boarded jan shatabdi early morning from Mumbai that takes around 5 hrs (the train goes up to Madgaon). 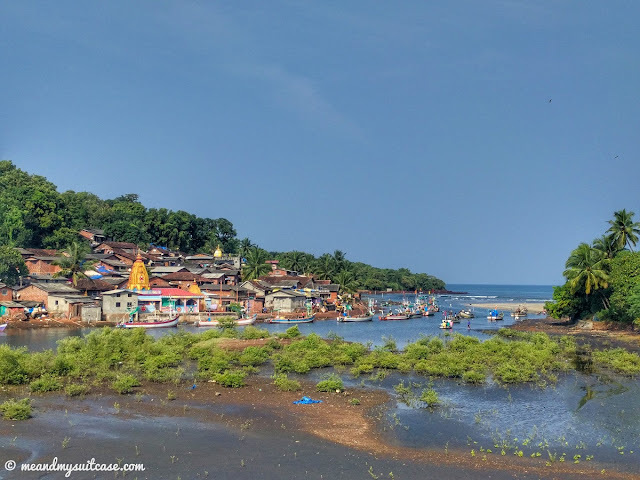 On reaching Ratnagiri, we headed directly to Ganpatipule (26 km), take bus if you are on a tight budget or auto, if you are 2 - 3 people or are okay with shelling Rs. 500 at once. Sonia and I met after ages so our non stop chat started right from Ratnagiri station, gorging on vada pav we headed to the highway from where we were told that bus to Ganpatipule can be boarded. But even after waiting for a long time we couldn't find a single bus towards Ganpatipule so we took an auto. The roads are well maintained and journey to Ganpatipule was pretty scenic. About an hour long journey to our beach destination went in a jiffy, courtesy the beautiful way and our continuous talk. As we reached Ganpatipule, it was beach right in front of our eyes, on left Ganpati temple and on right MTDC resort touching beach, a smile of joy and satisfaction lit up my face. 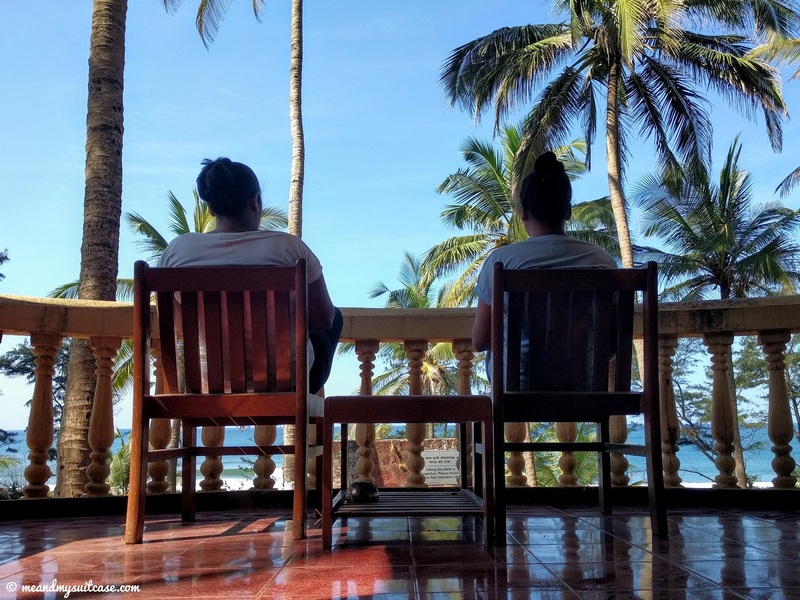 That sight was enough and we made our mind to stay at the resort and without checking any other property, before we knew we had checked in and were lounging in our sea facing room's balcony, relaxing and gazing at the tranquil beach. After unpacking and relaxing we headed to the resort's in-house restaurant, "Tarang". The restaurant is basic with reasonable price. It serves good and variety of food. Our lunch was filling and we were charged to start exploring. It was already 1600 hrs and although we had many places on our list to visit but we restricted to exploring Konkan museum, watch sunset at the beach and visit Ganpati temple. Prachin Konkan Museum is a life size, open to sky museum spread in 3 acre land. The museum depicts life in ancient konkan and takes you 500 years back in their social, cultural, historical background. The best part is that it's a guided tour, plus, the staff of the museum comprise of localites and mostly women. 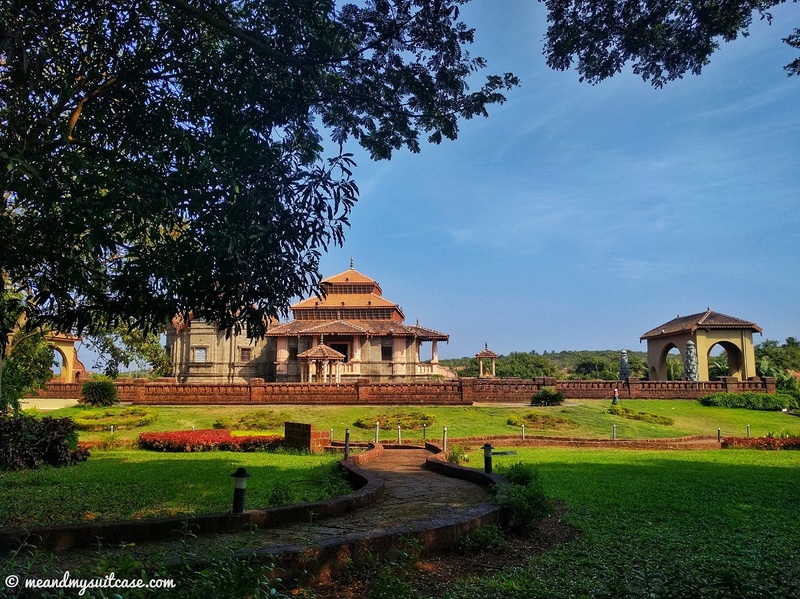 The museum starts through a small tunnel which represents "Present" & "500 years old History" and takes you in the latter as you cross the tunnel which then includes Tree Exhibition with more than 100 types of trees, Konkan Grandeur Exhibition, Naval force of Shivaji Maharaj, Forts Exhibition, Spice Garden, Sea-Shell's (here you can buy pearls and even see a few exotic fauna well preserved) and Handicraft Exhibition to name a few. There's also a small shop with interesting food items & souvenirs to take home and also a Machan from where you can get the view of city up to beach which is 1 km from the museum. 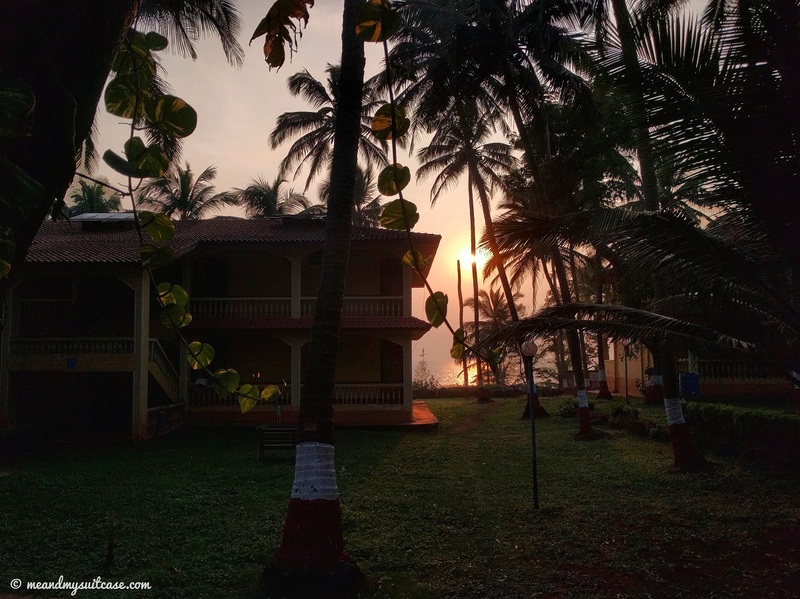 There is even Atithya Restaurant where you can enjoy real Konkan food. Konkan Museum was a very fascinating and one of a kind experience for me, and climbing up the machan was a first as well. We reached the beach right at the time of sunset and it was beyond doubt mind-boggling. Sometimes pictures are worth a thousand words and here are a few more from that eve. This white sand beach is very clean and has bluish green clear water which is rich in flora. The temple is adorned with the 400 year old Swayanbhu Ganpati idol facing west unlike other Indian temples which face east. The reason behind the former is that it is believed that by facing west, Lord Ganesha is guarding the western gates. The temple is in a huge complex, very well constructed and maintained. We prayed and witnessed the 1900 hrs aarti followed by prasadam which happens every evening after aarti. Prasadam mostly includes vegetable pulav, shira and achaar, I must say, it is as good as dinner in terms of quantity and taste is beyond words. Whatever served is enough to fulfill your appetite but not heart. For us it was also a great way to end Day 1. 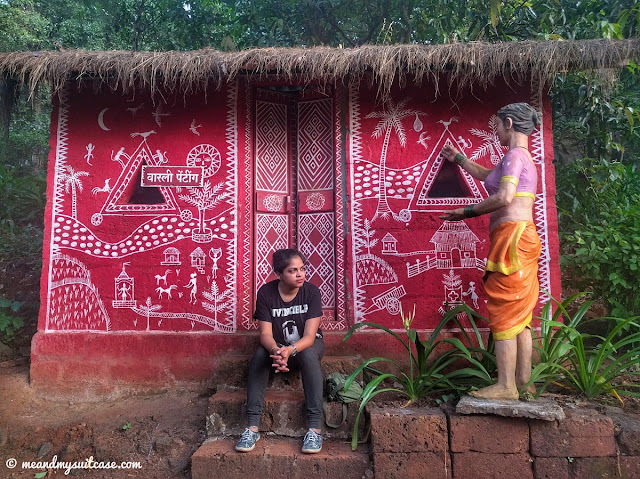 We got up early as we had to explore some hidden treasures in Jaigad which is around 20 km from Ganpatipule. We had breakfast at Tarang and hired an auto [Charges: Rs.800], you can also take the bus but that will take you directly to Jaigad and also they ain't frequent. The road is perfect with only at a few places with little bumps, it goes through the villages but mostly runs parallel to the coast. (I feel developing the same in to a west coast road can bring a real change in tourism in the area and employment as well). Nonetheless, it is one of the scenic roads I have taken on my road trips. Right next to the beach is a settlement predominantly occupied by the fishermen of the area. It is a beautiful small setting amidst water, facing the beach on west and a small creek on east. Colored in orange, pink and earthy shades, it is a beautiful contrast to the sea water. 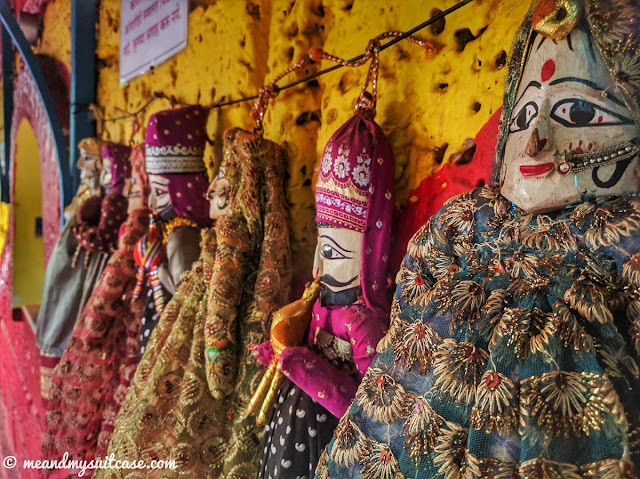 This temple was not in our itinerary, I no where had read about it during my research but Amit (our auto driver) brought us here and it was an amazing surprise to our itinerary. The temple is in a beautiful complex developed and maintained by JSW Group, the temple was also constructed by them. The architecture is inspired by Buddshism culture, and temple houses a big metal Ganpati idol. The complex also has a pond with many colourful fishes and a helipad. The temple is a blend of modern and old, it's like a confluence which I really loved. 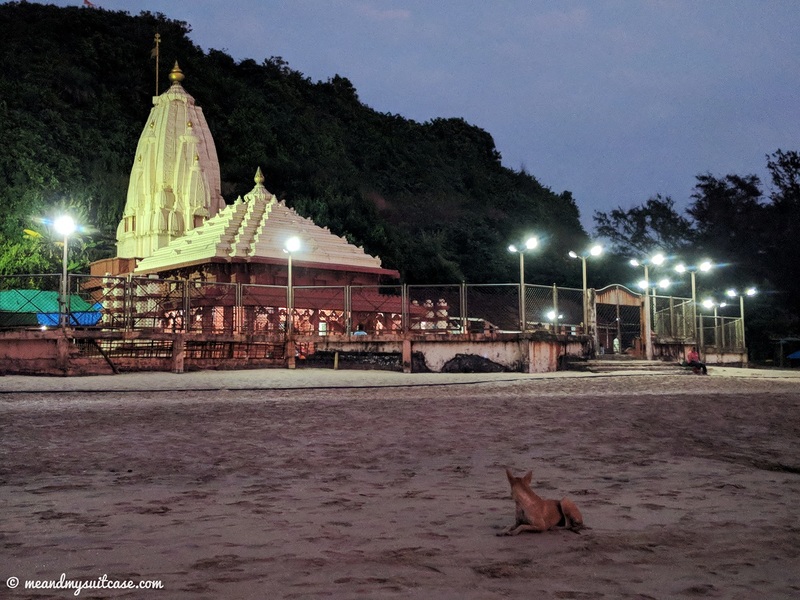 This wooden temple situated near the seashore of Jaigad belongs to divinities Shiva & Parvati and is surrounded by beautiful, unspoiled landscape. When we went there were no visitors and we had pretty good darshan followed by good photo-session in the surrounding. There is also a JSW set up near by with jetty at one end. I loved the location. I have always been fascinated by Light House but had never got the chance to go inside one. As we were approaching Jaigad Lighthouse, the landscape changed a bit. 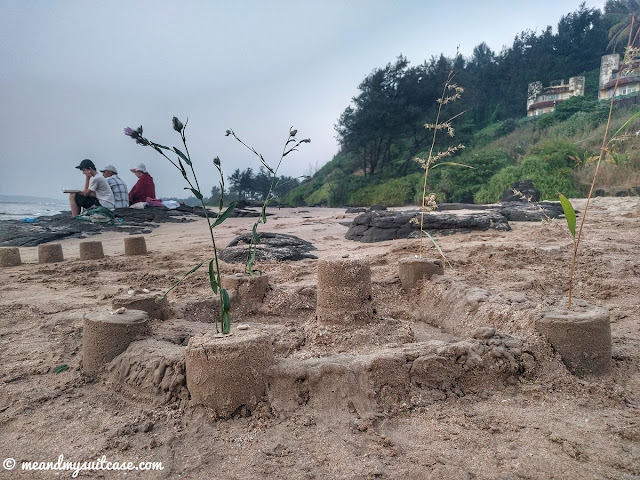 With golden tall and dried grass all around, beach on one side and pink & white colored Lighthouse on the other, it was like a scene right out of a cowboy movie. 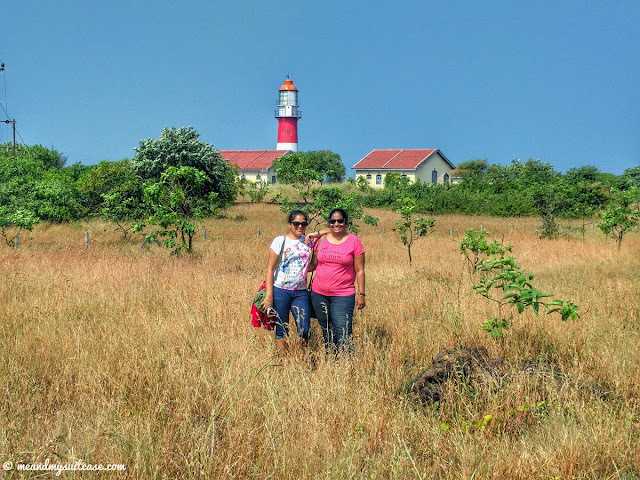 I fell in love with the area and could not stop myself from either posing or clicking some more pictures, alas, the light house was closed then but the same got compensated by the picturesque surroundings. Believed to be constructed in 16th century it came under British reign in 19th century. This coastal fortification is located at Ratnagiri's peninsula tip and gives a beautiful view of jetty and open sea. 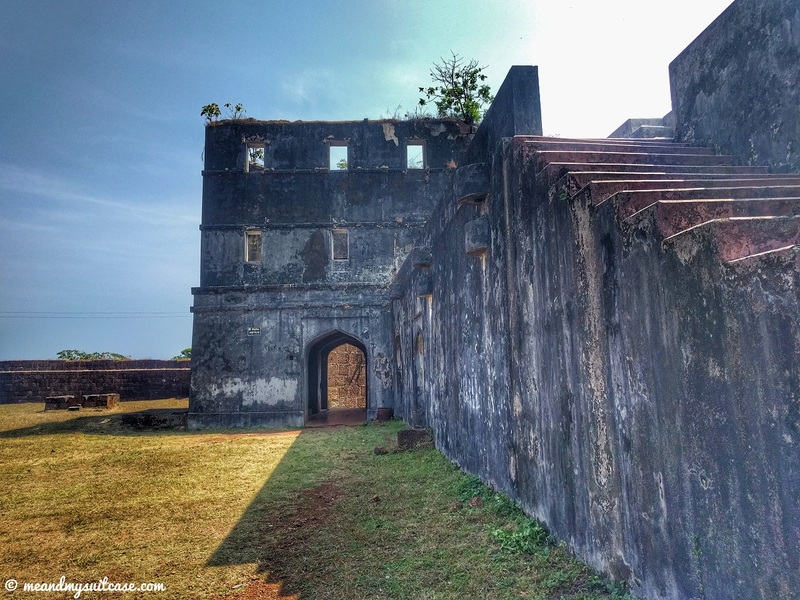 The fort is almost in ruins but still has sturdy walls and with little TLC (Tender, Love and Care), it can go a very long way. The site is rustic and has a lot to offer to a photographer. We kept hopping from one section of the fort to next on the inner line of the periphery and covered the whole fort. It is not very huge but has great views from all sides but one where you see the JSW plant which now restricts the view. 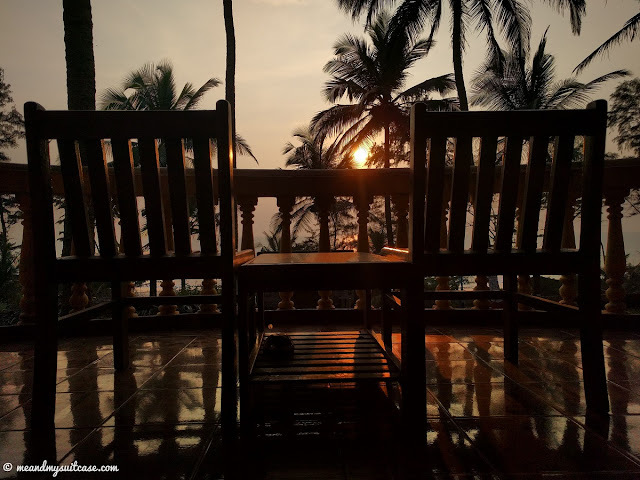 Fort overlooks the Arabian Sea and one would love to sit and relax here on a beautiful evening. 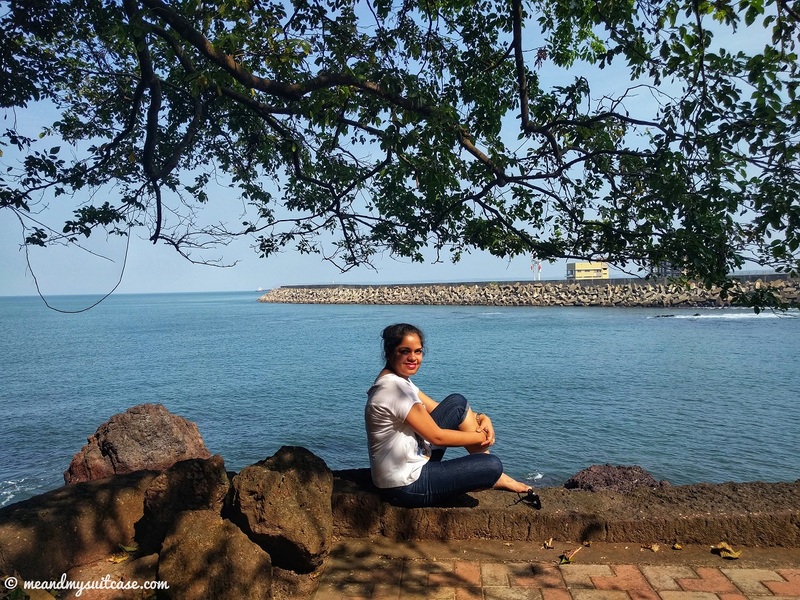 After spending sometime at Fort we returned to Ganpatipule with good, adventurous and rustic memories. Nonetheless, our driver was pretty cool as well. Later we had lunch in Ganpatipule and then headed to the resort to relax a little before spending another evening by the beach. In the evening before heading to the beach we took a slight detour and went for a walk (pradakshina) around the hill which pilgrims usually take as a mark of respect to the Ganpati temple which is at the base of this hill. It starts and ends at the temple but at separate ends. The end in fact leads to the beach. We ended Day 2 as well by paying visit to the temple after spending a lazy evening at beach watching waves crashing the shore line and sun meeting the horizon and then vanishing to give way to the night. 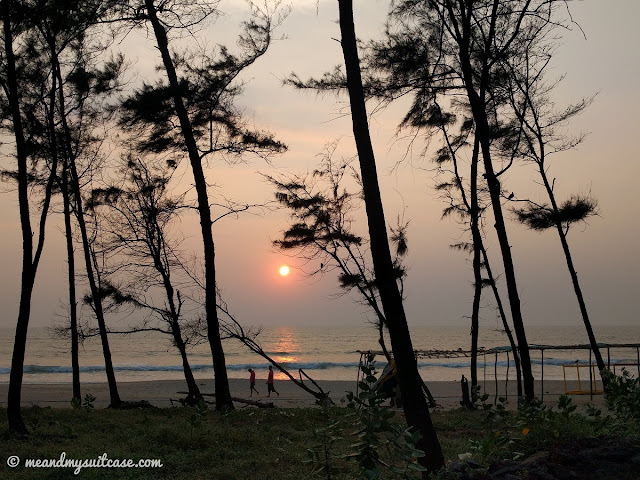 Day 3 & 4 will be covered in the next post which were spent in Ratnagiri but the journey on Day 3 will again start from early morning spent in the embrace of magnificent Ganpatipule Beach. We visited in November still it was little hot specially during the day. Sun is high so don't forget to keep yourself covered. Although it is a beach destination but as it is a rural town with humble crowd, choose your attire accordingly. Visit during winters but if you like to enjoy the famous mangoes of Ratnagiri, nothing beats a visit during summer. But seriously, winters are best to explore and enjoy outdoors. There are many other big and small hotels but I suggest MTDC resort specially for its location. Day 1: Reach Ratnagiri and leave directly for Ganpatipule. After check in and lunch, hire an auto to take you around in Ganpatipule it self. Places to cover: Bhairi bhagati temple, Trabakeshwar vidya mandir, hanuman temple and final drop at konkan museum. From there you can come walking to the beach followed by late eve at the temple. Day 2: Early morning Check out and leave for Velneshwar via Jaigad. Visit Jai Vinaya Temple, Karhateshwar temple, Jaigad light house and fort. Check in hotel / MTDC resort at Velneshwar and if time is their watch sunset at the Velneshwar beach. 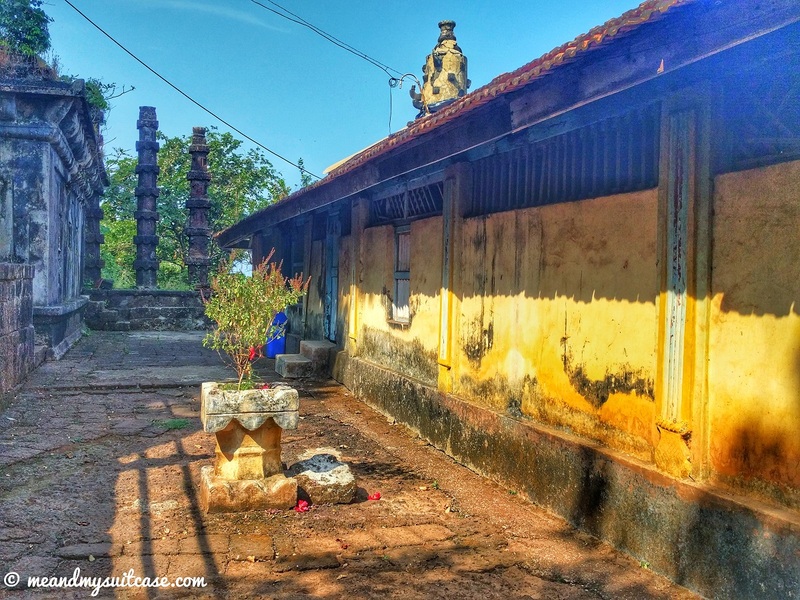 Day 3: Check out and Visit Velneshwar temple while leaving for Ratnagiri. Although we had initially made this itinerary but later were tempted by our stay location & breathtaking beach view thus converted our marathon trip in to a leisure stay. Stay tuned for our next leg of journey till then keep traveling. P.S. All pictures are mine and copyright protected. They are all taken by me unless otherwise mentioned. It was a read that came to wish me good morning lets pack! I had just heard of Ratnagiri so far but now there’s more. The lighthouse and jaigad fort area is just mesmerizing and perfect for cinematography. I am so glad that you liked it. 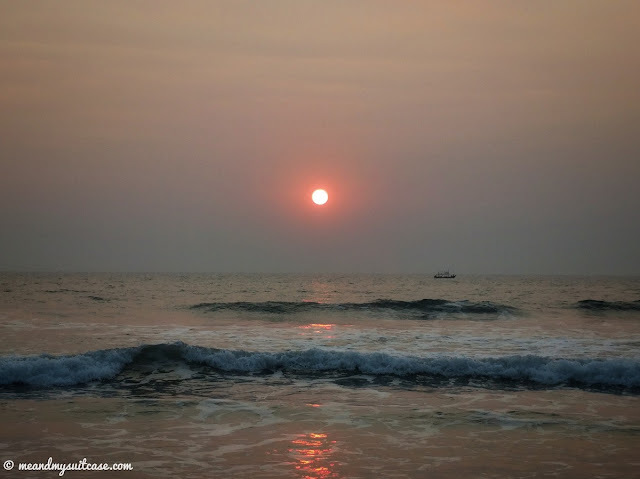 You will also love the morning colors in the water of ganpatipule beach. Ganpatipule and Ratnagiri are both wonderful places. We had visited them long back (even when we did think of blogging!) and have very fond memories of the place. We really enjoyed the road journey to Ganpatipule beside the sea. Loved reading your post. It made me think of exploring the Konkan coast again. Thank you Amrita. Glad you liked it. First time I heard about this place and I found it so cool to spend 2 to 3 days here. Not so crowded and reasonable..the beaches and temples are superb. It was great reading.. Thank you pam. You should visit it sometime. Thank you so much. Glad you like them :) Keep reading! I have fond memories of Ganapatiphule. Not many go there. But it's a very beautiful beach town. 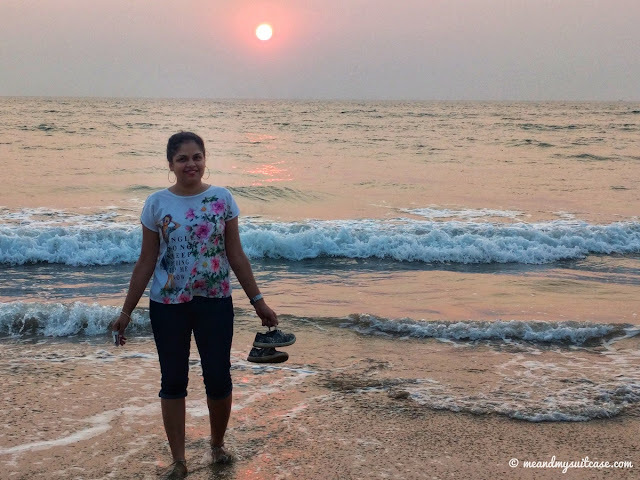 Maharshtra and Karnataka has the best of beaches which no one knows about.